However, I just read one of the most inspiring and honest articles about being a bride and getting ready for a wedding. (Thank you, @Hipmombrarian!!) And I can’t help but feel like an anti-bride right now. So, I’ve decided that I will at least put forth a little effort (really, just a smidge compared to what I’ve heard other brides do!!) to feel healthier, to be glowing and to look as amazing as my dancing heart and soul to be marrying my best friend, my personal hero and my better half. It’s impossible to overlook or miss the FLOOD of Pinterest pins about the “bridal bootcamp” or the “bridal body workouts” that can make you feel really flabby and less than fit. But instead of being overwhelmed by all the bridal fitness frenzy, I pushed myself to make a few small healthy adjustments without depriving myself or injuring myself, or spending hours of time in the gym – hours that I don’t have. What’s my game plan, you ask? Well, I’ve started getting up early in the morning and making my own healthy low calorie smoothies!! I also bought a FitBit Flex to measure my workouts and walking/jogging/running distances, and with my goal of eating 1200 calories per day I’ve begun documenting my daily meals through MyFitnessPal. I’m definitely at least pysching myself out to feel better about myself!! Throw it all in a blender with 6-8 ice cubes. It makes about a big ol’ 24 ounces total, and is only about 314 calories!! The best part is it will absolutely fill your stomach for a good four hours til lunchtime. My other meals are small and include lean protein, veggies and healthy starches, as well as healthy fats. 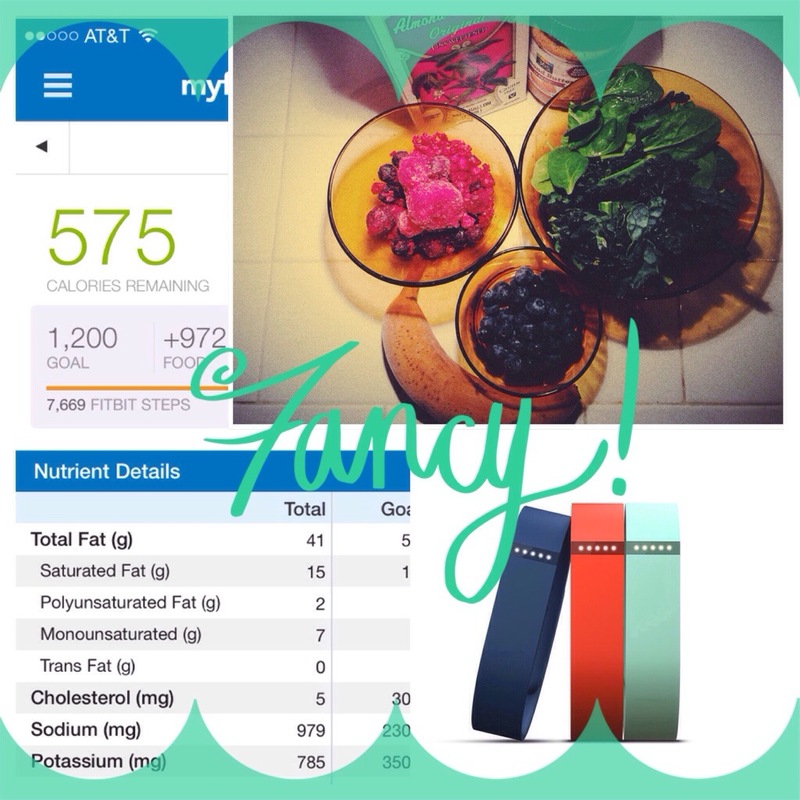 And the MyFitnessPal app will even tell you exactly how your daily meals measure up overall for a balanced diet. I hope to lose about 10-15 pounds in the next four months through these small adjustments. I will certainly keep you posted on my progress!! What are you current brides doing to feel great in preparation for your big day? Any advice you previous brides have to share? Passer un bon jeudi, mes beaux amis!! This entry was posted in belle vie, la cuisine, la fête and tagged fitness, food, health, weddings by rebeccawenstrup. Bookmark the permalink. Thank you for making us part of your healthy game plan :] Congratulations on your upcoming wedding. Thank you for being a fan of Coach’s Oats!